Writer-director Lorena Villarreal and Actress Melina Matthews talk with Jesus Figueroa about thier film SILENCIO. Would you use the power to turn back time? Is it worth killing for? Tulip Pictures and Barraca Producciones announce the U.S. release of “Silencio” on October 26. 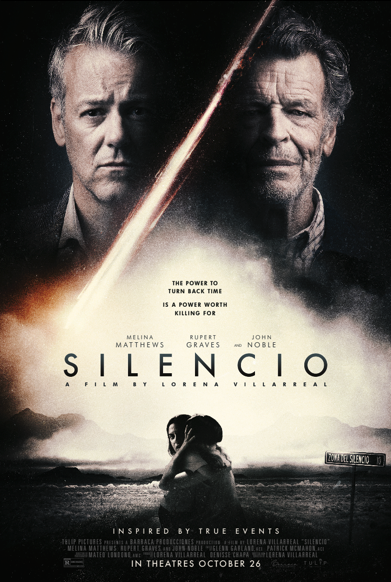 “Silencio” highlights a mysterious area in Mexico known as the Zone of Silence that has true events of the eerie. Located on the same parallel line of the Bermuda Triangle and the Pyramids of Giza, it has several events of the unexplainable including rocket crashes, mutations in plants and animals, meteorite strikes and much more. “Silencio” shares the story of Ana, (Melina Matthews) who struggles to save her son’s life. She must find a powerful stone her grandfather (John Noble) originally discovered with his apprentice (Rupert Graves) in the Zone of Silence in 1970. Throughout her desperate search, Ana stumbles upon long lost family secrets and discovers enemies who believe the stone’s power is worth killing for. Written, directed and produced by Lorena Villarreal, Denisse Chapa (producer) and filmed in Zone of Silence and northern Mexico locations, the film brings to life the local tales of strange occurrences that have been happening for decades.